When I started university I took a class on leisure. I remember being completely hooked on the class after the first lecture. We discussed what leisure truly means and explored the intrinsic value of playing. To me, something is intrinsic when a good feeling grows completely from within myself, not from some external source. When I play I feel naturally good, without being dependant on some sort of material reward. It is hard to explain in words, but just try to think back to when you were little and you were able to play for hours just by making up games or playing with everyday objects. I don't know about you but when I think back to playing as a little kid or I watch children play, I get this really sentimental feeling in my chest and I can't help but smile. Anyhow, at the end of the class our teacher asked each of us to think about a way that we play which makes us feel inexplicably good. She reminded us to think outside the box; just because the words leisure or play are often associated with activity or recreation, doesn't mean our favourite leisure has to be sports or running. We all sat on the question for a moment and it took a few minutes for my idea of leisure to hit me. 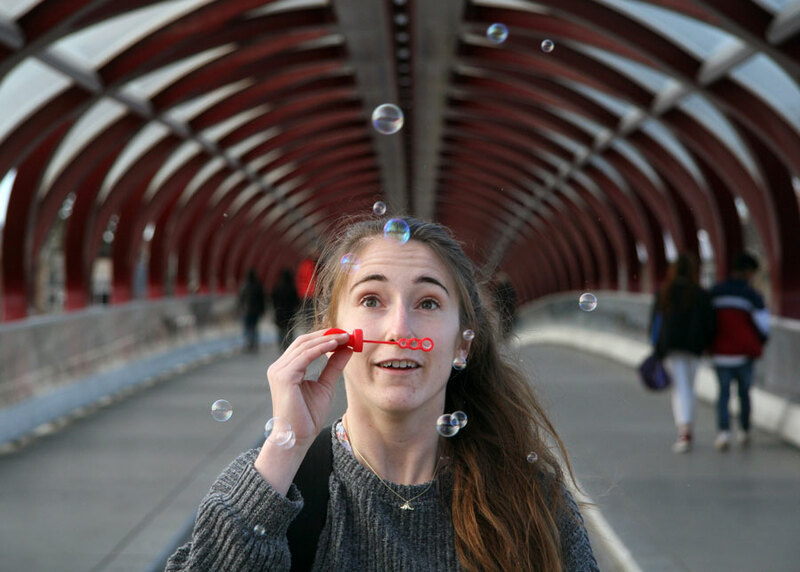 I distinctly remember the moment that I thought of blowing bubbles; I just felt so incredibly good and I had this huge smile on my face. My history with bubbles goes a little something like this... When I was about 15 years old I bought a tube of bubbles from the dollar store, it was a really cute tube with a dinosaur on it and a maze game on the lid. 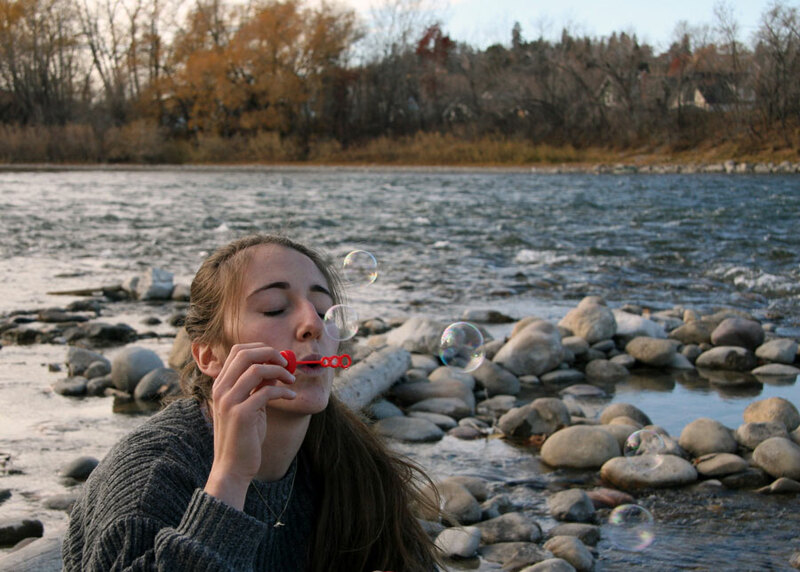 I was with my friends and we were going for a walk to the park to play and I thought playing with the bubbles with my friends would be quite funny. Little did I know, that it would become a lifelong obsession. By the time I was seventeen I had an entire drawer devoted to my many different bubble containers. 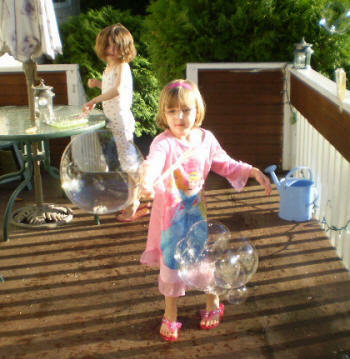 I had wands that could create massive bubbles and some wands that could make a whole collection of little tiny bubbles. However, to be honest, my favourite tube was (and probably will always be) that simple tube I bought at the dollar store. I actually used to bring that tube with me everywhere I went, even school... although, some of my teachers weren't too fond of me blowing bubbles in class. 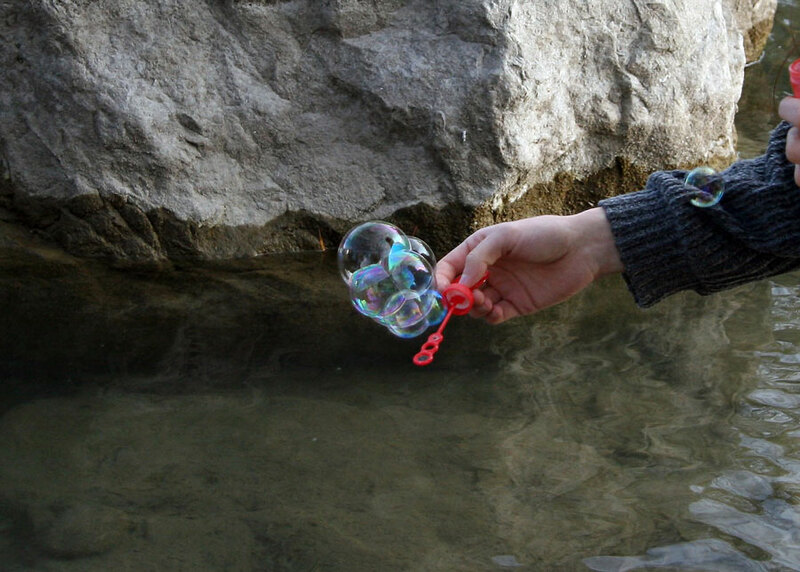 Still, to this day I always bring a tube of bubbles with me whenever I go hiking. I love to get to the top of the mountain, blow a stream of bubbles, and just watch the way they float around and stay in their group all they way along the mountain top. One of my hikes took me past the base of a relatively small waterfall. I was counselling a group of children on that particular hike and we stayed around the waterfall to explore for a little while. I brought out my tube of bubbles and just started playing with them. 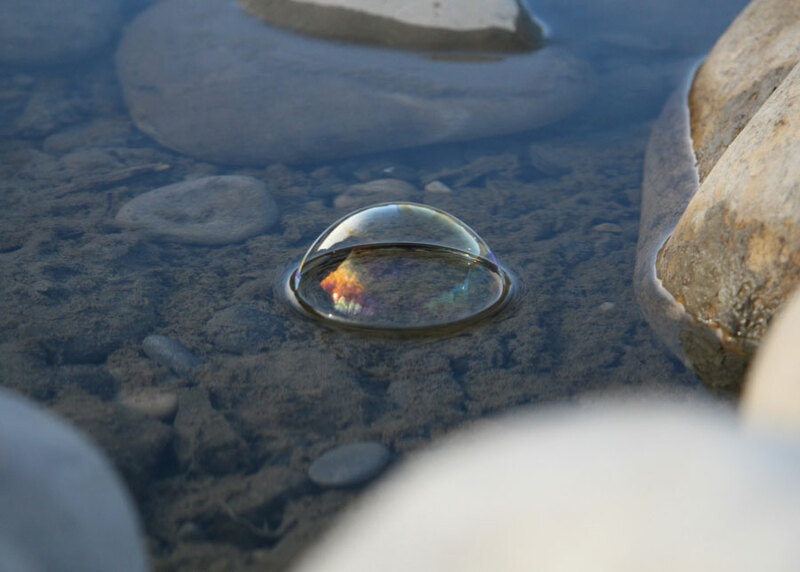 That was when my co-counsellor, our 8 campers, and myself realized the coolest thing ever... bubbles stick to water! I guess it makes sense given that there are bubble baths and bubbles when you do the washing up after supper, but it still felt like a really cool discovery! 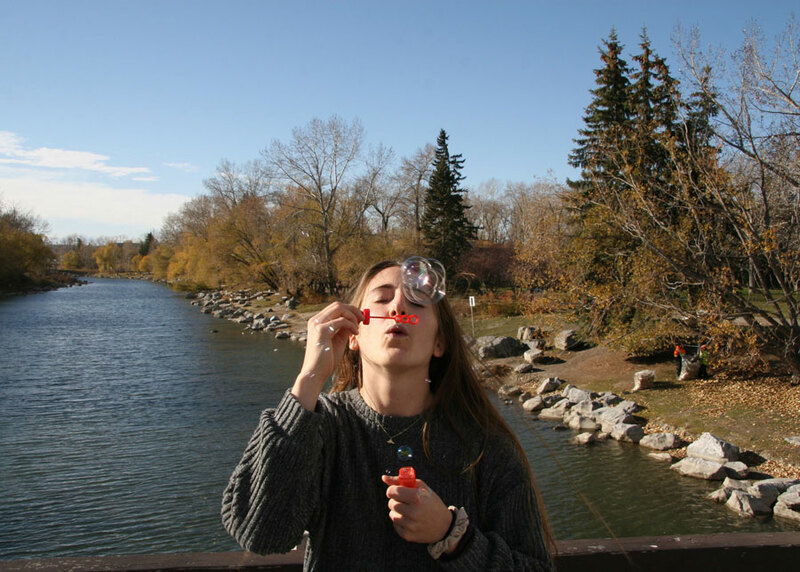 Writing this blog post has been great too because it gave me another reason to go and blow some pretty incredible bubbles at Prince's Island Park in downtown Calgary. 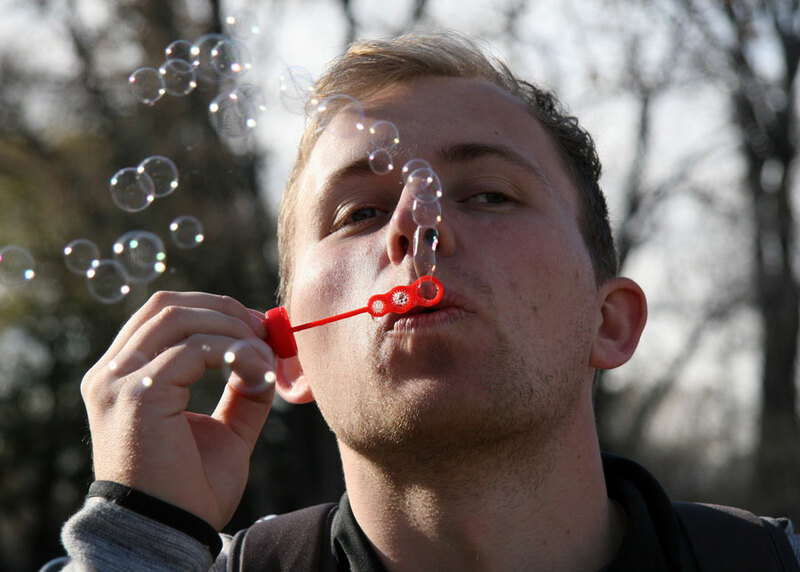 Callum and I went and spent an entire afternoon blowing bubbles in the park. 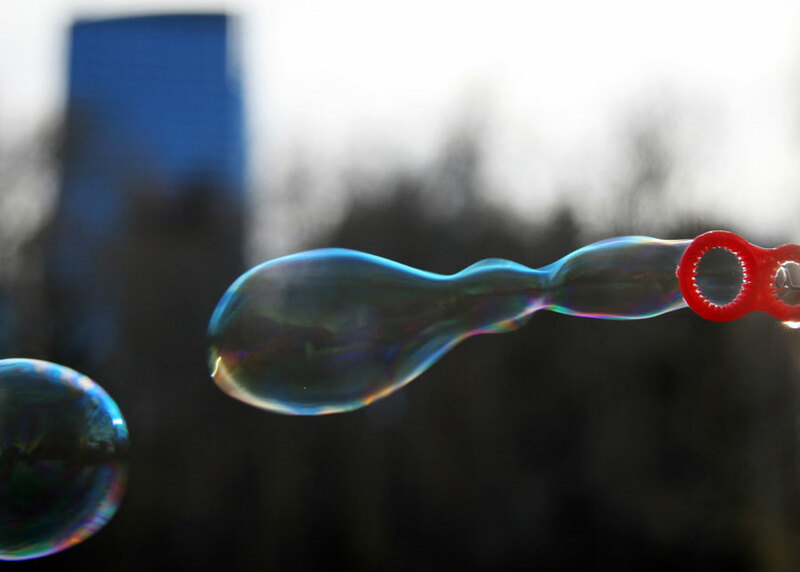 It took a few tries to master the art of photographing bubbles (those things move really fast!) but once we figured it out we tried so many neat ways of capturing the fun! At one point we were blowing bubbles near an open space. There was a little boy and his parents on a walk and he had a huge smile on his face while he ran around trying to pop all of the bubbles. And even better yet, so did the parents. It seemed like by the end they even had a great strategy where the little boy would pop the lower bubbles, his dad would pop the ones that floated really high, and the mom would get all of the ones that floated around or got past them. Anyways, back to the lecture... every person in our class ended up writing a really neat way that they play on a giant piece of paper. There was everything from swinging, to spinning, to playing sports. There were goofy things like writing with the wrong hand, drawing with your eyes closed, or even having a tickle fight with your children. One of my personal favourites was building blanket forts, which I now try to do as often as possible. After we had exhausted a seemingly endless list of ways to play, we had a big discussion about how we feel when we play. Our discussion ended up on the idea that since we were all grown ups now and so busy with school we felt we didn't have as much time to play. Luckily, for all of us in the class we managed to schedule some time together to actually practice playing again, just for fun! 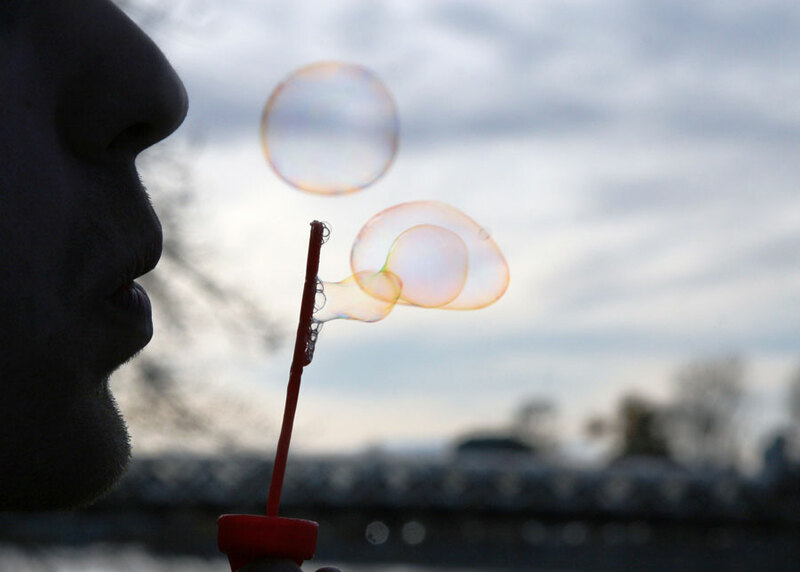 How to Make Homemade Bubbles and a Bubble Blower! Mix all 3 ingredients together. Liquid sugar is the best kind to use -- something like corn syrup. If you don't have liquid sugar, lemon juice works too. Don't stir or shake too much! Store in a sealed container. Lasts forever (we've always used it up without ever having any troublewith it going bad). Tape the holder to the straw. Pour bubbles into bowl or pan. Dip into bubbles and twirl around. Makes LOTS of BIG bubbles. Disclaimer: My opinions are my own. All photos in this blog post are copyright Kaitlyn Guenther. I am Kaitlyn, the K in DLTK, and I've been working for the family website since I could hold a crayon. Now I am all grown up and I live with my partner, Callum, and our adorable cat, Juicebox! When I'm not helping my parents on the site, I am studying psychology at the University of Calgary. I love my work and my studies, but when I can I love to head out to the mountains and enjoy the outdoors! You can connect with me on Facebook or Instagram. You can also follow my cute kitty, Juicebox, on Instagram.